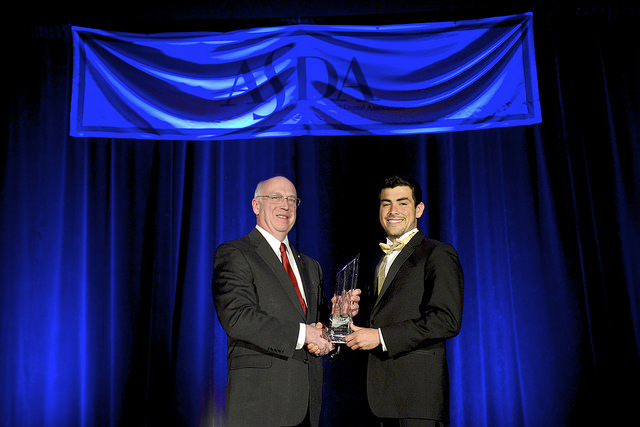 The American Student Dental Association named Dr. William Calnon, the 2011-12 ADA president, as this year’s recipient of the Paragon Award, the highest and most notable award given by ASDA. Dr. Calnon received the award, which recognizes an individual who has significantly contributed to the advancement of the rights, interests and welfare of dental students, at ASDA’s annual session Feb. 20 in Boston. “Dr. Calnon has been an excellent mentor for dental students both in New York and across the country throughout his career in organized dentistry,” said Greg Shank, ASDA District 2 trustee. Dr. Calnon, of Rochester, New York, has served as past president of the New York State Dental Association, the 7th District Dental Society and Monroe County Dental Society. He served four years on the ADA Board of Trustees before becoming ADA president. He is a fellow of the American College of Dentists, the International College of Dentists and the Pierre Fauchard Academy. He serves as the current president of the Eastman Dental Center Foundation. It is great to know that Dr. William Calnon was honored by the American Student Dental Association in 2012, with the highest and most notable award that is given by the ASDA. Recipient of the Paragon Award, there was probably no one more deserving than him. The increase in involvement of dental students will surely encourage Calnon to continue his good work. Yeah Nancy It really great to know that Dr. William Calnon was honored by the American Student Dental Association in 2012, with the highest and most notable award that is given by the ASDA.